Let’s propose that we split a camera down into slices. Each slice has a wide data channel connection with usefully potent power lines. There is also a series of holes through which bolts can be threaded. 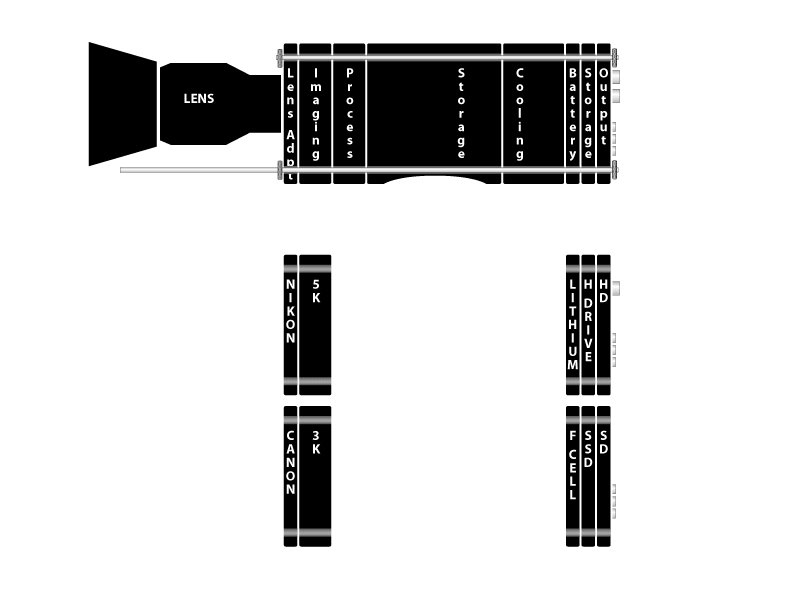 The whole modular camera concept could be built around rails which could hold all the slices together and jut out the front of the cam for mounting lens and mat boxes. 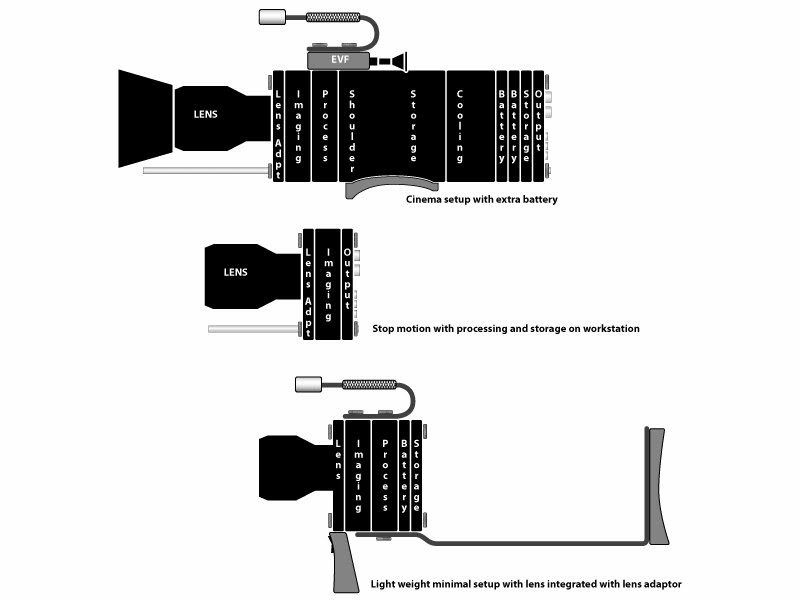 Lens on the front, a then a lens adaptor slice (this could have all the logic and connectors to allow hook ups to Canon or Nikon or whatever,) then imaging chip, processing module, storage, and batteries. The customer buys a basic package of slices. Enough to capture an image, and store it. Then the customer could purchase optional slices/functions. Maybe I want to bolt on two batteries, and or an SSD??? ...Maybe I’ll move one of the battery packs behind the shoulder mount to improve balance??? ...Do I need the audio slice? Maybe I’ll strip everything but the lens and imaging chip (do the processing on a workstation) and use it for a Stop-motion rig? A slice with two lens mountings and imaging chips for 3D. Why duplicate all the other circuitry, which is what would happen if we bolted two cameras together? New form of storage is invented. Then out goes the Hard drive. New imaging chip is released. Then slot it in. GPS module for location tagging. Lidar accessory to paint depth into each frame. 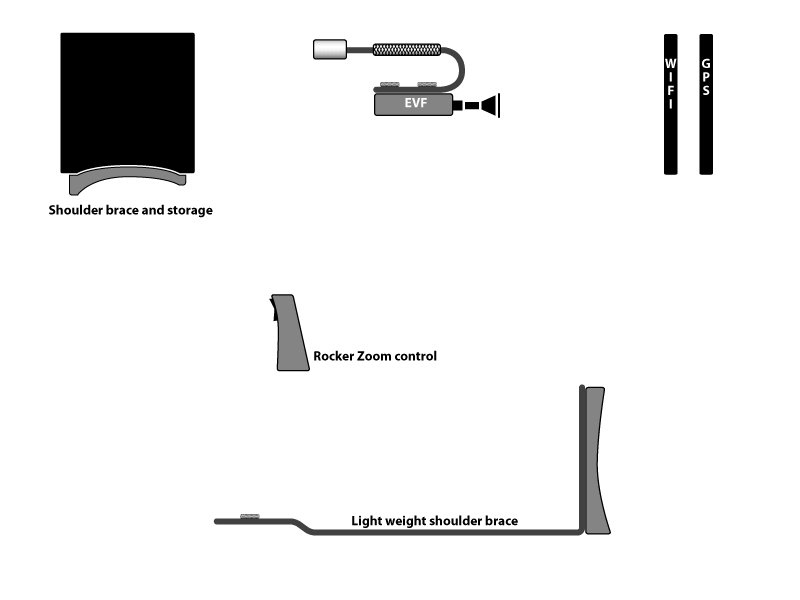 A modular design, would allow the camera company to standardise components across the range. Be it control panels, or BOB, or storage options. The data bus that allows the slices to communicate to each other. This would allow the camera company to ‘out source’ components that might be beyond their resources to produce in-house.